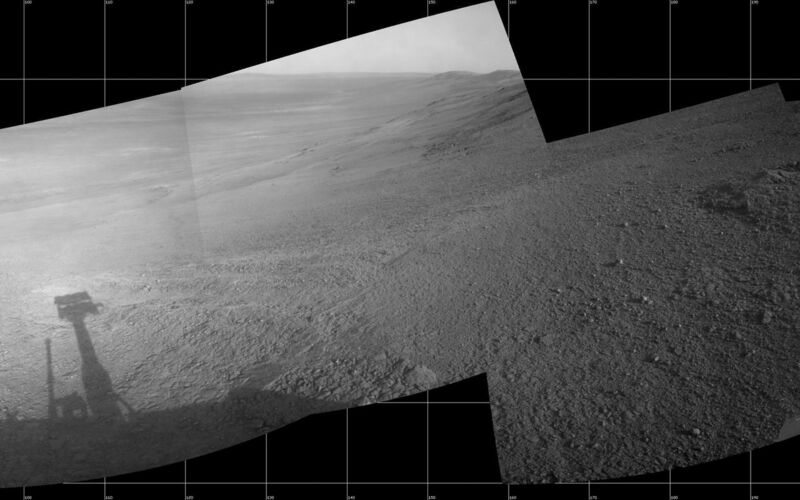 This mosaic scene combining five images from the navigation camera (Navcam) on NASA's Mars Exploration Rover Opportunity shows a view from inside the upper end of "Perseverance Valley" on the inner slope of Endeavour Crater's western rim. The valley is the main destination for the current two-year extension of the 13-year-old Opportunity mission on Mars. It was likely carved long ago by a fluid, such as water, water-lubricated debris or wind. 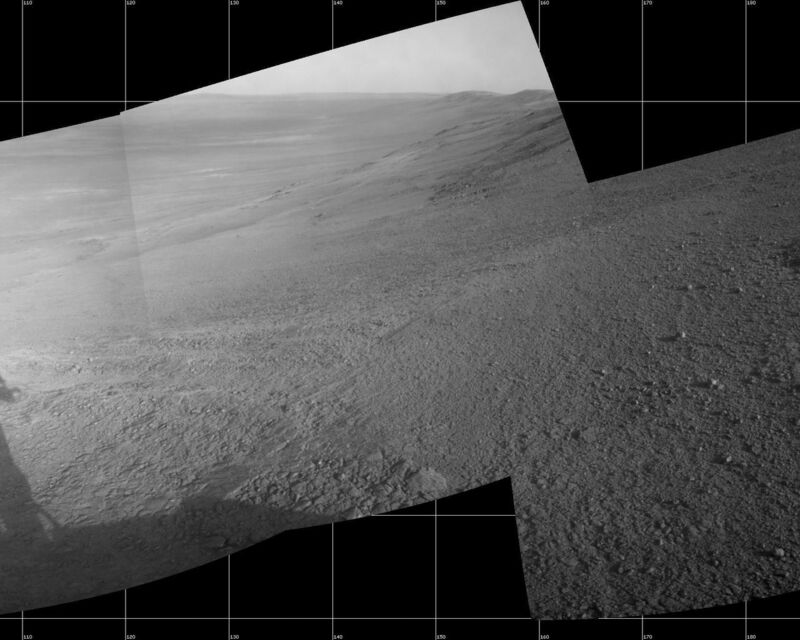 The rover team is using Opportunity to learn more about the processes that shaped the valley. Plans call for driving the rover down the full length of the valley, about twice the length of a football field. Opportunity entered the top end of Perseverance Valley after studying the area just outside the crater rim above the valley during the spring and early summer of 2017. The images combined into this scene were taken on July 7, 2017, during the 4,782nd Martian day, or sol, of the rover's work on Mars. 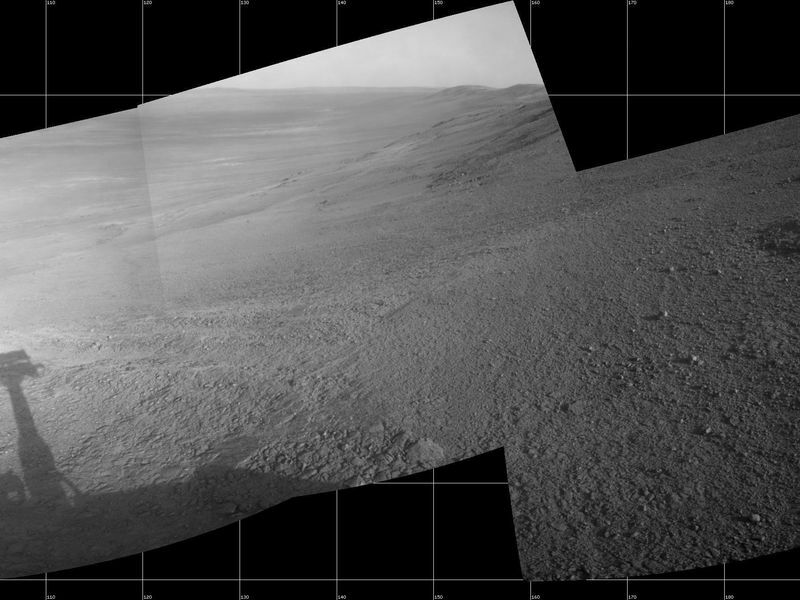 Opportunity had driven about 45 feet (13.8 meters) earlier that same sol. The portion of this scene to the left of the shadow of the rover's mast shows Perseverance Valley descending to the floor of Endeavour Crater. Foreground areas in the middle and right sections of the scene shows terrain details in the upper end of the valley. More distant in the center section, the rim of Endeavour Crater extends southeastward. The full scene spans from northeast at left to southwest at right.